Thanks to Instagram, with a couple of clicks we can see how people are dressing around the world, and we're not just talking about the usual fashion capitals such as Paris, Stockholm and Milan. South African style blogger and artist Lulama Mlambo—known as Lulama Wolf—proves that it's worth paying attention to what the girls are wearing in SA, and she's quickly become our latest Instagram obsession. 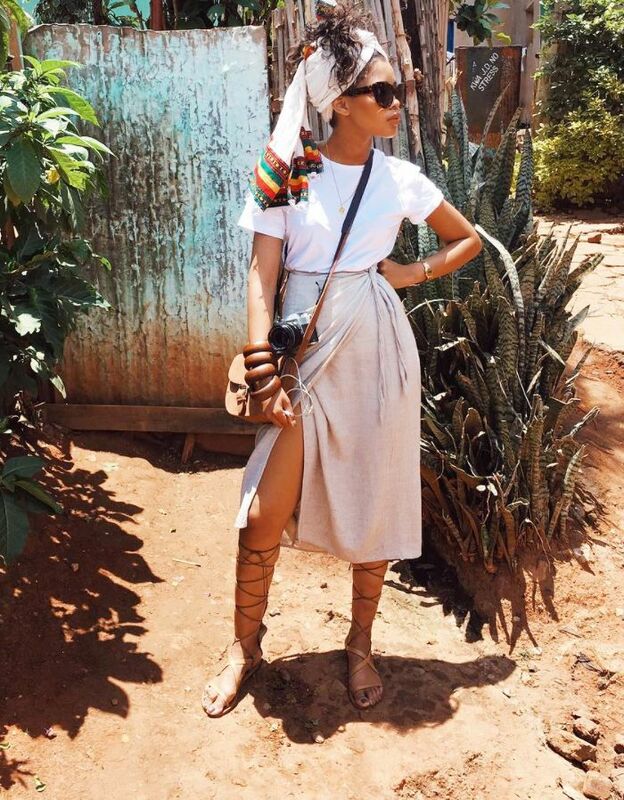 Lulama can teach us all a thing or two about summer dressing, as she often leans on a number of effortless outfits that you can probably re-create with items you already own. She described her signature style to H&M as "a mix between minimal and African aesthetics. I call it afro minimal." She often rewears her favourite basics, including Adidas three stripe track pants, oversize shirts, white block heels and a black leather jacket, but she always adds extra personality with her accessories. Scroll below to see Lulama's amazing style, and then shop her signature pieces to re-create her look. Style Notes: Lulama tends to stick to basics, usually wearing light cotton tees and skirts, but she then uses accessories to make her look stand out. Here, for example, she wears a colourful scarf, stacked bangles and gladiator sandals with ties wrapping around her legs up to her knees. Style Notes: When it comes to sunglasses, Lulama tends to favour retro or vintage-inspired sunglasses, which add extra personality to her everyday basics. Style Notes: For those hot summer days, nothing beats a cool sleeveless cotton dress and backless espadrilles. Style Notes: Adidas tracksuit bottoms are perhaps the one thing Lulama wears the most on her Instagram, and we love how she smartens her joggers with white block heels and an oversize striped embroidered shirt. It's an outfit that in theory shouldn't work, but it looks effortless. Style Notes: Lulama adds personality to her classic minimal swimwear by wearing retro round sunglasses and a printed scarf in her hair. Style Notes: Once again, Lulama shows that the cropped tracksuit bottom and block-heel combo is a winning formula. Style Notes: A white T-shirt and a pair of rolled-up high-waisted jeans paired with black expensive-looking loafers are so simple, but the result is so good. A sun hat is another Lulama essential. For more summer style, see our guide to the biggest trends for S/S 17.